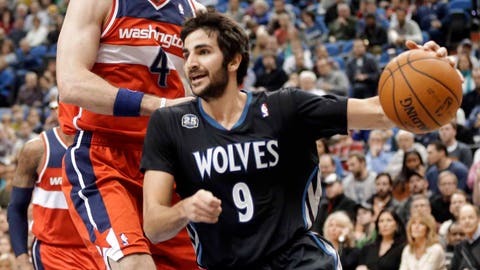 Ricky Rubio had a good night, filling the stat sheet to the tune of 11 points, 9 assists and 8 rebounds. MINNEAPOLIS — The Minnesota Timberwolves have made the 2013-14 campaign equal parts tantalizing and maddening for their fans. Wins against Western Conference luminaries have often been followed by setbacks to teams seemingly bound for the next NBA Draft Lottery. Friday, however, offered a chance for Minnesota to satisfy 16,473 paying customers at the Target Center, and the home team didn’t disappoint, in a 120-98 win over Washington. "It was just a pure team effort tonight," said Timberwolves center Nikola Pekovic, after his 18-point, 10-rebound outing. The Timberwolves (14-15) spent little time toying with their foe in this contest, following Kevin Love’s early scoring surge, in which he scored 11 points in barely two minutes midway through the opening quarter. Love ended with a team-high 25 points and 11 rebounds. "I thought we played well coming out of the gates," Love noted. "It was a good effort." The hosts committed just four turnovers on the night, connected on 31 of 38 free-throw attempts, and got 30 combined points from reserves J.J. Barea and Alexey Shved. "It’s no secret we need more production from our bench — that really helps out," said Love, praising Barea and Shved after the reserve guards combined to hit on 11 of 17 field-goal attempts. After a first half highlighted by the hosts’ 10-1, second-quarter run, Minnesota put the clamps down defensively on Washington star John Wall. After scoring 22 points in the game’s first two quarters, Wall was limited to just four in the second half. "We wanted to keep him from getting to the basket," Timberwolves coach Rick Adelman said of Wall. "So it was really important that we got back (on defense)." Added Minnesota star Ricky Rubio: "In the third quarter, the plan worked out. . . . In the third quarter, we just played aggressive. We didn’t want to let that game go." Washington (12-14), which beat Minnesota 104-100 on Nov. 19, hung around a bit in the third quarter, thanks to respectable showings from the likes of guard Bradley Beal (14 points on the evening). But Minnesota, now 9-4 at home this season, imposed its will throughout much of the second half. And, by the time Love splashed in a 3-pointer from the corner with 8:01 left in the third quarter, the hosts were largely in control, up 71-51. As far as the home faithful was concerned, all was as it should be on this night. Love recorded his league-leading 21st game of the season in which he had 20-plus points and 10-plus rebounds. Rubio looked solid, too, filling the stat sheet to the tune of 11 points, 9 assists and 8 rebounds. Minnesota had fluid ball-movement and played up-tempo, scoring 18 fast-break points. "They attacked the basket," Wizards coach Randy Wittman said of the Timberwolves. "They were tougher than we were. They pushed us around and we had no resistance." Now, Minnesota hopes to gather momentum. Five of the Timberwolves’ next seven games are at home. And, after solid performances like Friday’s, there’s still reason for hope in Minnesota’s locker room. "I think the opportunity is there," Adelman said early Friday, "and that’s what this is all about in this league: If you have the opportunity, are you going to go out and close the deal? "Every day is gonna be important now," the veteran coach added. "After Christmas now, things kinda settle down, and most teams have an opportunity like we do. Who’s going to take advantage of it is the key. "We’ve got to get something going here."